Good morning everyone - I am so glad you could join me today. I have a great project I want to share with you. 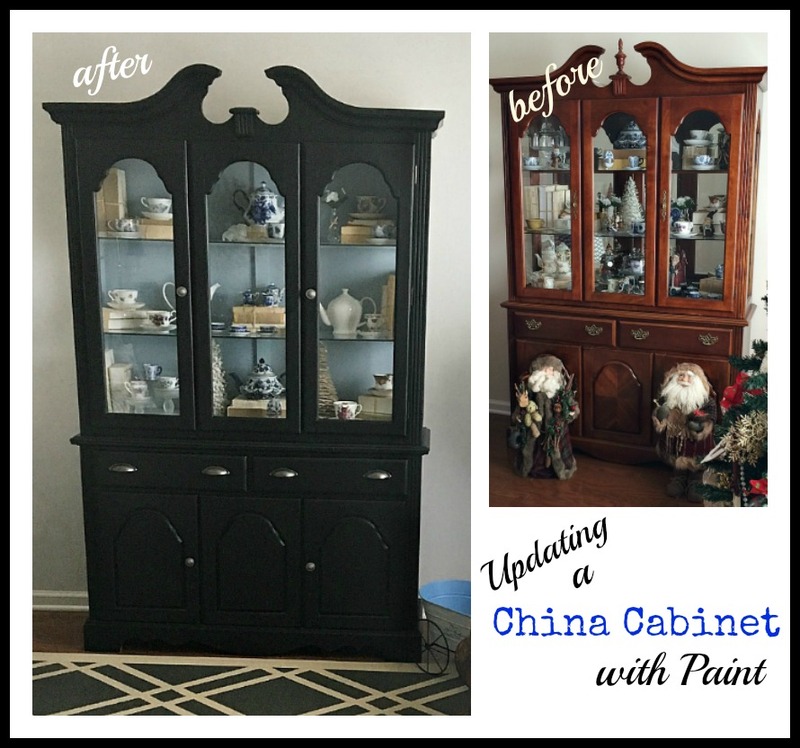 I was going through some pictures the other day and realized I had never shared my china cabinet makeover with you. I can't believe I forgot because it is really one of my favorite projects. Here's a picture of how it looks right now. 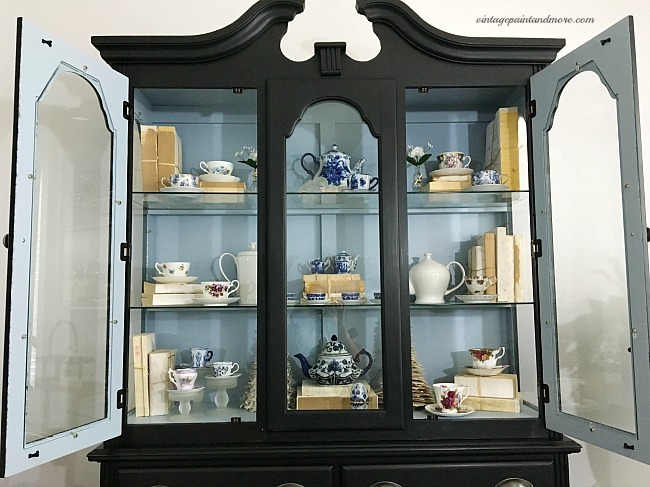 I love the black with the pop of blue on the inside - it makes it such a trendy farmhouse piece now. And, although it took me a while to finish - it really was a simple process. 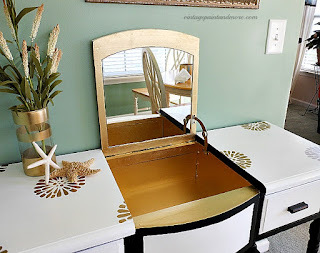 So, let me share with you how I achieved the finished look. 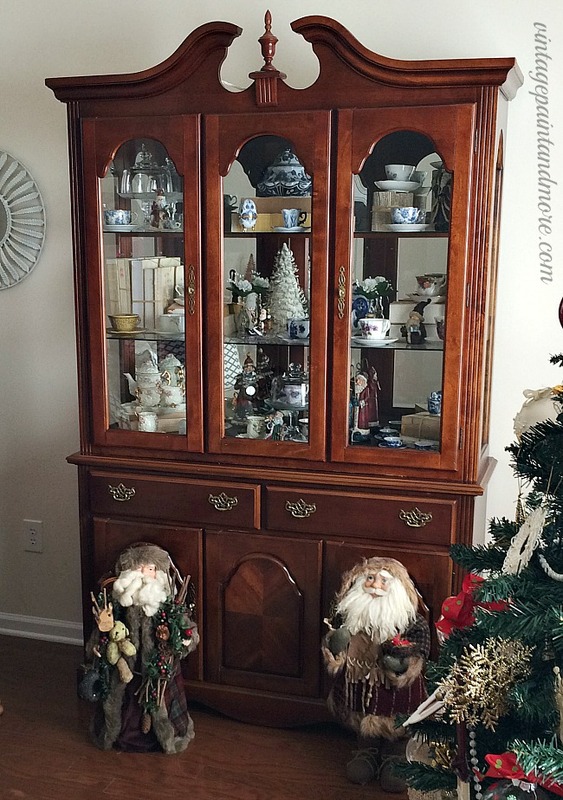 Forgive the fact that this is a Christmas picture, but it truly was the only one I could find of this cabinet. 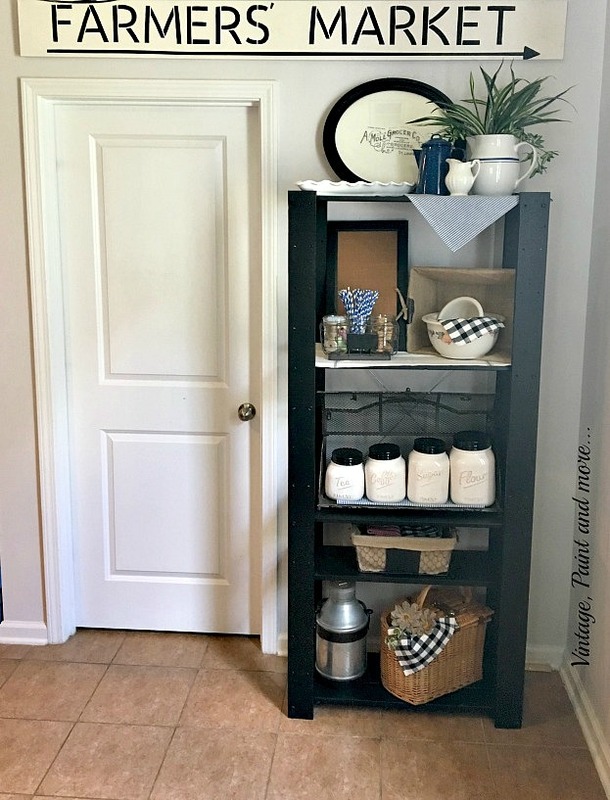 I bought this cabinet several years ago with the sole purpose of making it over after seeing one that Courtney of The French Country Cottage had done. Isn't it gorgeous? 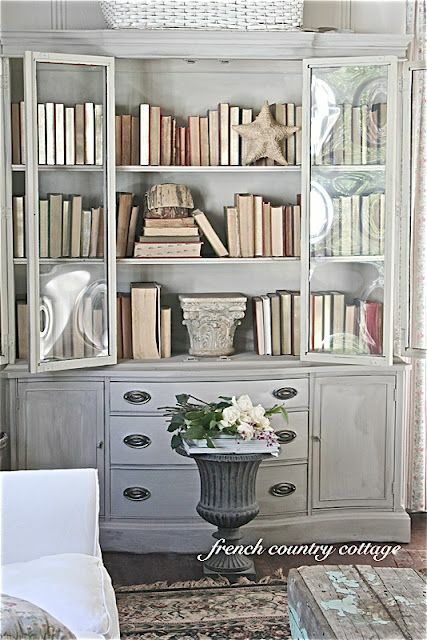 I love the gray with all the covered books - it just makes such a beautiful statement. 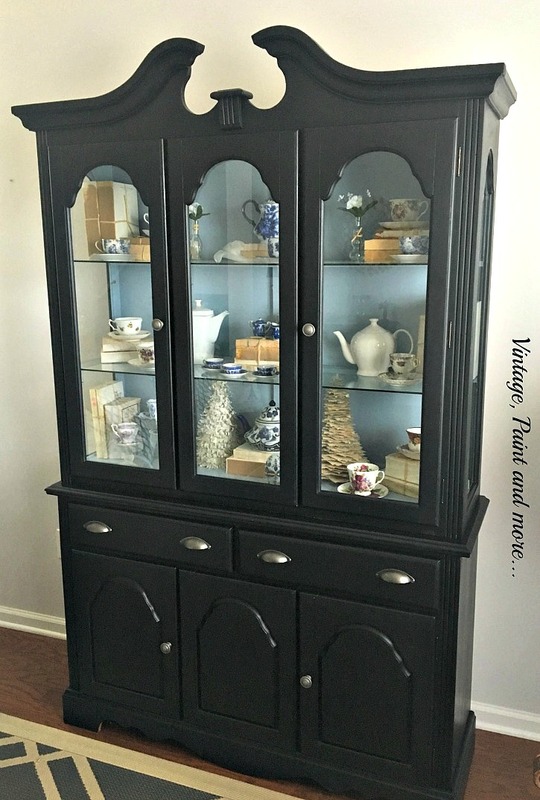 Well, best-laid plans ... Hubby was hearing nothing of painting this cabinet - he loved the wood tones and thought painting it would ruin it. He actually dug his heels in on this which happens very rarely and so, I honored his wish - for a while. Then I put my blog on hiatus and really thought I was not coming back after a health issue. 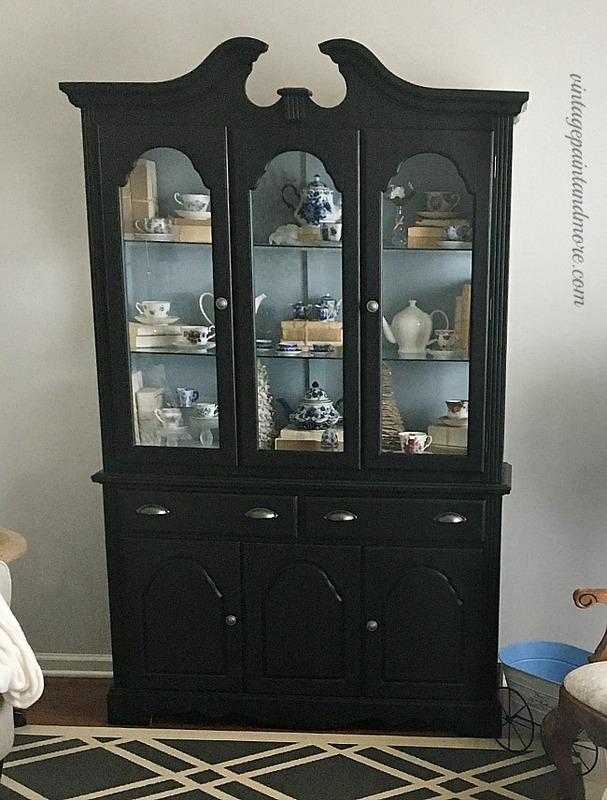 But, one morning I woke up and decided to paint this hutch and hubby was so glad to see me excited to do something that he said absolutely nothing. 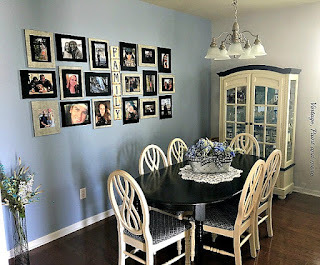 When I finished, it was a far cry from what I originally wanted but, our tastes as a family has changed and I decided to paint it to fit into our style now - which is a modern vintage farmhouse. This is how it looks now. And, I love it. 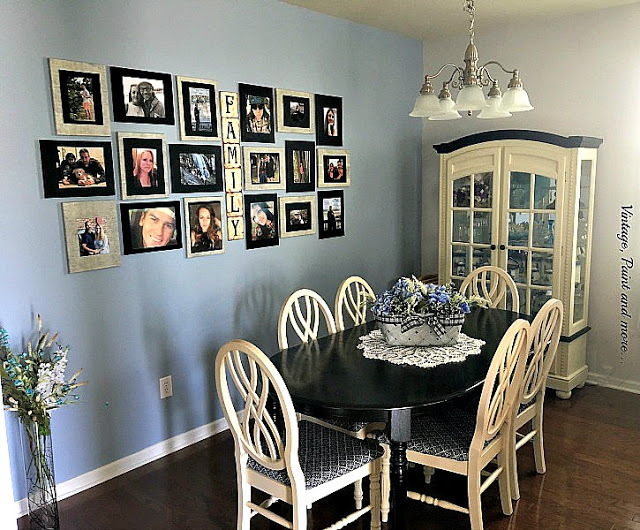 It is a definite improvement over what it was and brings it into this new modern farmhouse look that is so trendy right now. I have no pictures of the process because I really thought I was not going to be blogging again. But, I can tell you the steps I took to take it from very dated to this new trendy look. Remove all the glass, hardware, drawers and doors. Clean it well, sand it and then wipe it down with a tack cloth. You can prime it now if not using chalk paint. 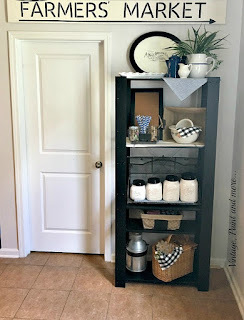 However, I used Rust-Oleum Black Chalkboard Paint - which does not require priming. It took 3 coats. Then paint the inside of the cabinet - I used a blue paint I had on hand. Did I say I love it? Well, I do. Here's a closeup of the inside of the cabinet with my collection of teacups and saucers. I love how the blue pops against the black of the outside - so pretty. Do you have something you have been waiting to update? Go for it - you may fall in love with it all over again and the outcome may surprise you and any naysayers that live with you. So until next time, happy DIYing and do something that makes you smile. If you want to make sure you don't miss all the great projects I share here be sure to sign up for my emails in the bar at the top. I love the cabinet. Actually I like the before and after. But the after really has the Wow factor. Thank you so much Derba. Thank you Pamela. So happy you found this inspiring. I love painting the insides of pieces contrasting colors - just make thm so much more interesting. Thank you for stopping by. Cathy it looks gorgeous. I love that you used chalkboard paint. It has such a luxurious matte quality and is really farmhouse inspired. Thank you Mary. I have fallen in love with black chalkboard paint and use it on everything. Thank you for stopping by. You did a really nice job, love how it turned out. Thanks for sharing on To Grandma's House We Go! Thank you so much - I do like it better than before. That's beautiful, Cathy! I love the blue inside ;) Thanks for sharing at Vintage Charm!